Today, in a world full of smartphones, tablets and terabyte hard drives, it’s hard to remember that not too long ago a computer was a big machine, bytes did not need any prefix, and by storage we meant cassettes or floppy discs. By searching the archives of Bytes Magazine, we found some classic tech gear from the 70s that may have been hot back then, but that no one would buy today. It may not be cheap, and it may not be top of the line anymore, but at least it’s “Low power”. With about 16,000 of these, you got the RAM equivalent to an iPhone 3G for just over $2,000,000. Way before large hard drives and cloud storage, there were cassette, and this was the interface. The best part, we would say, is the included 37-page manual. Definitely no “plug and play” here. Storage is cheap today, but that’s not always been the case. For $1,480 you could, in 1975, get a piece of equipment that could store over 300,000 words on just one floppy disk (who even remember ‘words‘?). Even though we are not talking about the same kind of words, “The Lord of the rings” books are a bit over 500,000 words so if you are a writer you probably need more than one floppy disk at home. If you are thinking of storing photos, just forget it. Remember the movie “War Games”? A modem like this and a computer were all it took for a young man to, almost, start World War III. The only problem today is that you need an old phone to make it work, and there is no app that will fix that for you. Everybody needs a Q kit! But what it is used for, we don’t know. It seems to handle a lot of different things, that much we know. Some 30 years ago, $2679 may seem like a lot of money. Today, that would equal about $9,000. But in that price, the 90 days warranty is included and the ability for “quick change of printer fonts”. It cost you $20 extra to get a monitor that may work. But even then, it may require “minor repairs”. Besides the computer and the audio cassette interface, you get a 512 character CRT. That is almost enough to put 4 tweets on the screen at the same time. A “2 in one” deal. 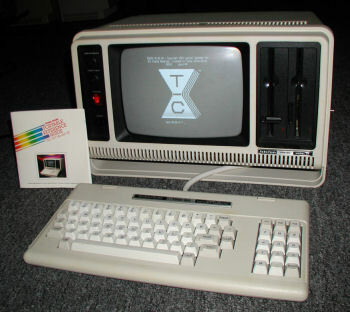 This bad boy can be used as a typewriter and a computer terminal. We are speechless, a real bargain indeed. By looking at this picture, we really can’t figure out how “The applestick” works. It seems like gaming in the 70s was a lot more complicated than nowadays. Are you laughing at this tech gear? The development of computers has been mind blowing over the last 30 years, and it is easy to make fun of technology from the past. Surely our kids are going to make fun of the technology we use today. Our guess is that our phones and our “high speed” Internet access will appear as silly to them as the acoustic modem to us. Do you have any favorite classic tech gears? Share with us on Twitter or in the comments below. Price war, uhh. I remember what the 7805 is. Actually I’d really like a QKit sensor. That was an idea well before its time. @pingdom 🙂 This is neat! @jag4091 Them were the days! Thanks for the post. This really took me back! I’m even thinking about getting one of the TRSes down out of MY attic and hooking it up for old times sake.